The latest FNC Inc. Residential Price Index™ (RPI) shows that U.S. home prices continue to climb higher, rising 0.7% in July. As of July, foreclosure sales nationwide are approaching the pre-crisis levels. The latest FNC Residential Price Index™ (RPI) shows that U.S. home prices continue to climb higher, rising 0.7% in July. The index is reaching a three-year high as the housing recovery continues. The rapid declines in foreclosure sales and new foreclosure filings have diminished the impact of distressed properties on home prices. Meanwhile, steadily rising home prices and an expectation of continued recovery have stimulated housing turnover by prospective buyers who are in a position to take advantage of affordable home prices. As of July, foreclosure sales nationwide are approaching the pre-crisis levels. Foreclosure sales accounted for 12.2% of total home sales, down from 17.3% a year ago. The latest August median sales-to-list price ratio rose to 97.2, or a 2.8% listing price markdown among closed sales, up from 93.9, or the 6.1% listing price discount, from a year ago. 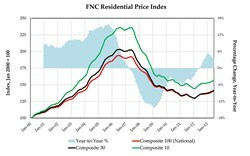 Based on recorded sales of non-distressed properties (existing and new homes) in the 100 largest metropolitan areas, the FNC 100-MSA composite index shows that July home prices increased from the previous month at a seasonally unadjusted rate of 0.7%. On a year-over-year basis, home prices were up a modest 3.9% from a year ago. The two narrower indices exhibit similar month-over-month and year-over-year trends. Nearly all the major housing markets tracked by the FNC 30-MSA composite index show rising prices in July, led by Denver, Phoenix, and Las Vegas at nearly 2.0% each. Home prices in Phoenix shot up another 2.0%, the 18th straight month since the recovery began that the city has seen such strong price momentum. The Las Vegas market exhibits similar price accelerations in the ongoing recovery, driven likewise by rapid improvement in the distressed market segment. As of July, foreclosure sales in Phoenix and Las Vegas comprise about 11-12% of total home sales. In contrast, the recovery has been relatively slow in cities including Chicago, Cleveland, and Columbus, where foreclosure rates remain elevated at above 20%. There are signs, however, that foreclosure sales are picking up speed despite their dampening effects on home prices.